The first thing you are being asked once you get married – when are you going to plan for a family? How does one react to such a question? Till date I have no answer to this question. I’ve learnt, no matter what you do, relatives will just ask, ask and ask. But, what does one do when your husband asks you these questions? When I turned 35, the first thing that my husband asked me, if I’m anyhow serious to raise a family. I wonder – am I? I had lost all the hope with the previous two miscarriages and being on the heavier side did not help at all. To top it all, I had a severe case of not one but multiple fibroids, the size of lemons. I was surprised, why? Because, without any physical interaction whatsoever for two months, and a week of period, I was pregnant. The little sperm somehow found its way. Chuckles!! All my life I never needed a gynecologist. And every time I did need a gynecologist, it was for a bad news. I was very cautious this time and always used to remain in doubt – “what if?” I kept wondering if there was a right doctor for me who could turn the phrase ‘third time’s a charm’ true for me. So we just walked into the hospital and met the doctor we could see first. She greeted us with a warm smile and a in a motherly nature. Well, with that personality, she won me over and gained my instant trust. Our consultation went well and we were happy. Next day – I had heavy bleeding. Shocked would be an unsuitable word. May be devastated, yes, now that’s the right word for the situation. All the past images and feelings started floating in my mind and I couldn’t stop thinking of “the abortion procedure”. We rushed to the doctor, all scattered and broken, falling apart. One look and a single word from the doctor calmed us down, she said, “if I’m able to feel the heartbeat of the foetus, I can save it“. Guess what!! We had a heartbeat!!!! I was on the cloud 9, happiness surrounded me. Next thing I knew was I’m going to be admitted to the hospital for a safety routine. Next morning I woke up all groggy and blurred. The last thing I heard before slipping back into a deep sleep were my doctor’s words – “I want to save this baby”. These words kept ringing in my ears during my whole pregnancy. The journey doesn’t stop here. One month past the hospitalization I had bleeding for the second time. Again, my life seemed to have taken a halt. What now! Well, I took a deep breath and went to my doctor with a complete faith, if she can save me once, surely she can save me for the second time also. Lo and behold, my little foetus was safe, sound and cozy in my womb. As the days went by, everything was fine until I enter my ninth month. There was no movement or any action in my tummy, I feared. Why is the baby not moving, no kicks, no pushes. What’s happening?! I tried all the possible remedies to make the baby move but there was no change in the situation. Immediately, I rushed to the hospital where I almost had a tiny heart attack or so at that time. Nurses and the doctors were summoned. Sonography showed that the baby was sleeping and suddenly woke up by the sound of many people around me and started kicking. The happiness I felt at that very moment can’t be expressed in words. I thanked my stars and prayed a lot for my last few weeks to go without any more surprises. Thank God for showering His blessings on me. I delivered a healthy baby. Now, with my little one in my arms and being hugged by her with a naughty twinkle in her eyes… I just can’t stop thanking my stars for getting this doctor in my life. It’s been a year now and she’s growing up really fast. While writing my experience, I’m feeling all those feelings and emotions that I felt at that time. For any women this is a great journey with lots and lots of adventures, though it may seem like a cakewalk for many, but ask those moms who are really at a risk during their whole pregnancy. Nightmare would be an understatement for those nine months till delivery. A complete bed rest. Never skip this or take it lightly. Keep a pillow under your legs (resting your calf on the pillow). Trust your doctor and follow its instructions. Of course you can check google for minor doubts. But make sure that you consult your gynaecologist also. Take your medicines and food on time. Sleep, sleep, and more of the sleep is the mantra for a healthy pregnancy. Speak to some other expecting moms and share notes with them. At any point of time if you feel your baby is not kicking or has been inactive for more than 1.5 hours; have something very sweet or listen to music, your baby will respond immediately. If you still feel there is no activity, immediately rush to your nearest gynaecologist. Nothing to worry as 99% of the time the baby is sleeping which worries us. If you ever find any blood or light spotting, immediately consult the doctor. In most cases it is nothing to worry about as the blood from the placenta drips out. If you have a low lying womb in the 5th month, my personal recommendation would be, ‘DO NOT’ get out of bed and lie with a pillow under your legs. It’s a matter of 5 days and your baby will position back in its right place after that. And in my mind I keep saying – are you guys for real? Are they? Do I really need a second child? Is it true when people say that only child is a lonely child? Well, now that would be a topic I’m going to share in my next post. So, stay tuned!! 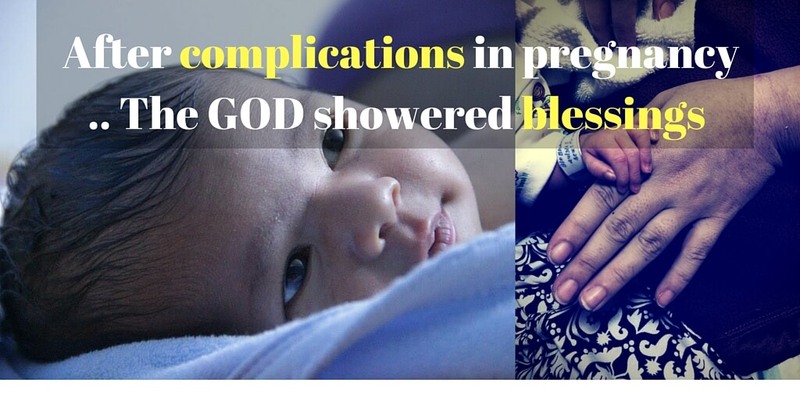 The article has been shared by Bhanumati Madhwani, who faced a tough time with her pregnancy but now a happy mom.